Easily insert images directly from Adobe Creative Cloud Asset browser into a Cacoo diagram using our Adobe image chooser feature! You can upload PNG, JPEG, GIF, TIFF, PSD, AI and EPS files. All files will be automatically be converted to PNG when inserted to a diagram. Open the Cacoo diagram editor. Insert an image file by clicking the "Import" icon. Select Insert an image from Adobe Creative Cloud Asset from the drop-down menu. Sign in to your Adobe Creative Cloud account or create an account directly in the Adobe wizard. 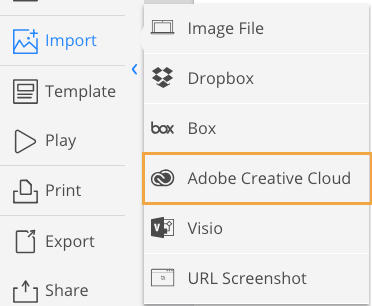 Select an image from your files stored in the Adobe Creative Cloud Asset folder. The attached file will appear on your diagram.